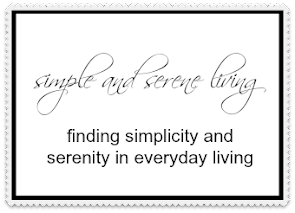 I have spent a lot of time over the last month looking at decor styles on Pinterest and trying to decide what brings me a sense of real peace and serenity. I am really not one to follow trends, but tend to go with what my heart tells me. I've also been thinking about how I want to incorporate some of the pieces that I have in storage into the small space I will be moving into. 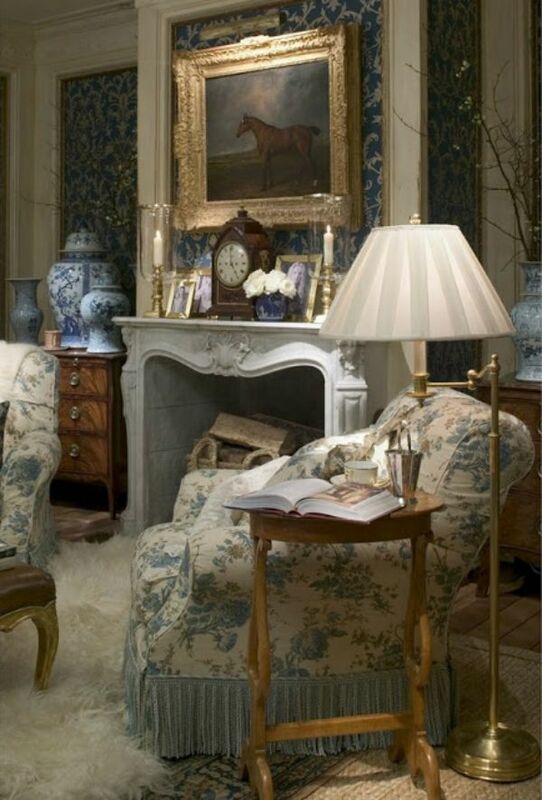 Although I will never have these stone walls, I love the floral chairs and the beautiful antique secretary. Speaking of secretaries, I have one in storage that is very similar to this one. Can't wait to see it again. Horse prints seem to be a must in an English cottage room. I have two that I purchased about 40 years ago. I am hoping that they survived the pilfering of my things several years ago, but I will have to wait and see when I move. 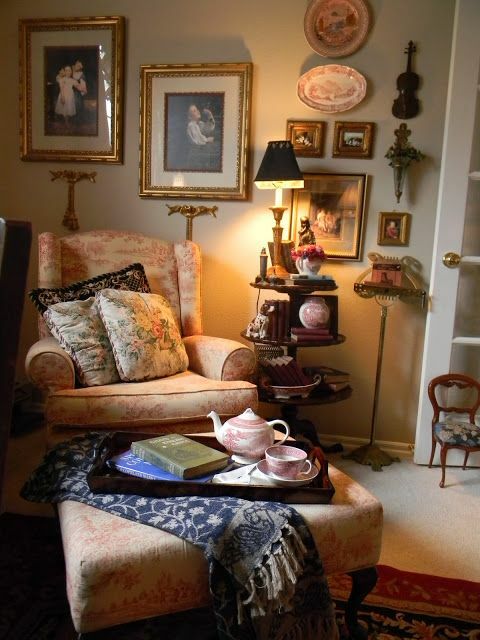 This looks like a cozy spot to sit and read, write my blog, or work on some needlepoint. Have I said that I have decided to take up needlepoint again? It is something I loved doing when I was younger. I found it to be very relaxing. Fresh flowers seem to be an important part of an English cottage living room. I can live with that. 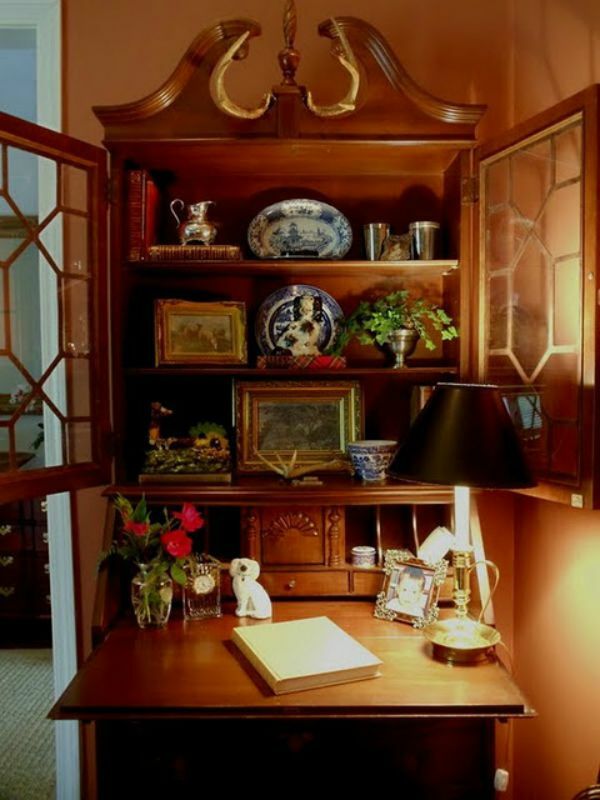 How do you feel about English cottage decor? I am feeling like I have found my style for my new home. Laura, I do love English Cottage decor, it's so charming and quaint! What grand photographs, each one has so many beautiful and amazing details! If I were you I'd get the secretary out, bet it is awesome! Have fun creating your own Cottage look! How fun to needlepoint, I've thought getting back to my knitting. I'm waiting for it to get a bit cooler! I love the rooms and pieces of furniture and accessories you've shown here, Laura. I don't think English Cottage ever goes out of style, it's just a classic. It is what I've tried to make my bedroom, even though mine is nowhere near as expensive a look as the above. It doesn't seem to matter, even more humble pieces work with this decor. I hope you find the pieces you've saved and can make the nest that will comfort and inspire you! 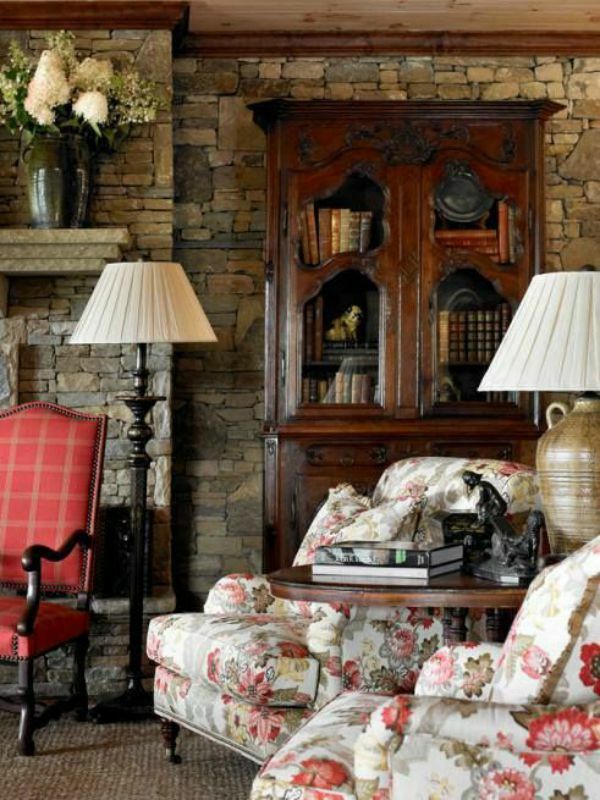 I love the English Cottage look.....would love to bring the look into my home.I can't imagine my husband sitting on a lovely floral chair as he thinks leather is the only way to go. I think it is beautiful, but a little formal for my type of furnishings. I cannot wait (and I know you can't!) till you get your space! I like the quiet gentle colours - but ours is a little more IKEA and Scandinavian, with a layer of Stuff with Stories. I think it's lovely but I don't seem to have any of that kind of furniture. Do you know when you will be moving? I know you are excited! The English Cottage look is so cozy and welcoming. I hope you find the pieces that were missing. You must be getting excited about moving. I think your style is welcoming, lovely, cozy, with a touch of elegance. I love the fabric and I can visualize those nooks to be perfect for reading and needlepoint. It never hurts to look and pick up ideas for your plans. I don't like to be pegged in any sort of style but I can really find inspiration by a variety of ideas on Pinterest. English Cottage style is so pretty! I love it! I love the English Cottage style. Can't believe how gorgeous those stone walls are!! Great pics. Enjoy your weekend, dear Laura. I love this look too although I don't have it. :) You've watched the movie The Holiday, I'm sure. I can just stare at the cottage pictures. Beautiful Laura. It is a peaceful and pretty style. I know with adding your stored pieces to the new place it will be beautiful. I like the coziness of that style. I also like the femininity of it. I think it will be perfect for you! Well, I'm pretty sure you know that I love it ;) I think my home has a touch of this look, but on a more vintage level, if that makes sense. That first picture speaks to me on many levels. 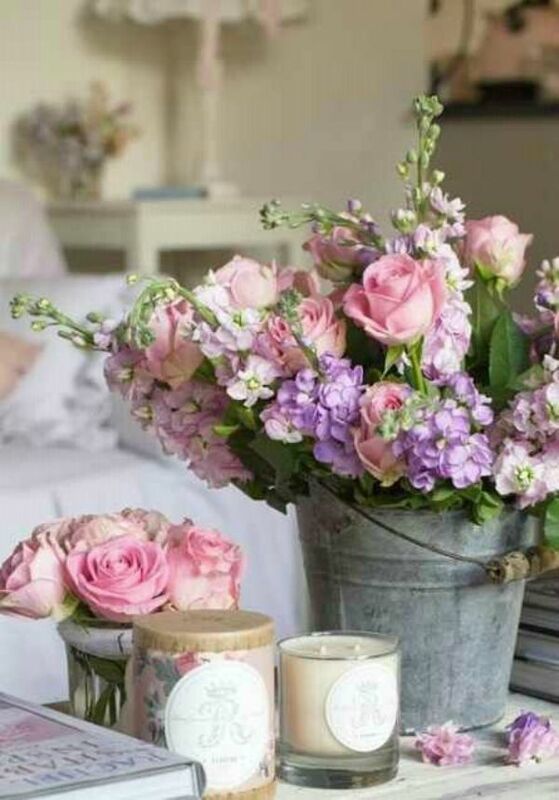 I love English cottage style and you found some great inspiration pictures!